Police departments around the country are no strangers to using Facebook to help catch bad guys. But reports out of the Pacific Northwest suggest that Idaho’s Latah County Sheriff’s Office may have gone one step too far in how it used the social network to try to catch 19-year-old Andrew Cain for marijuana-related and other non-violent charges, ultimately cyberbullying the teen into committing suicide. 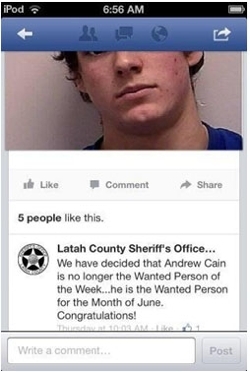 Last week, the Latah County Sheriff’s Office posted a Facebook comment about Cain in an attempt to taunt the teenager into turning himself in. “We have decided that Andrew Cain is no longer the Wanted Person of the Week,” read a public comment issued by the department over social media. “…he is the Wanted Person for the Month of June! Congratulations!” The police also sent Cain private messages over the social network, offering the teen a copy of his wanted poster for turning himself in. According to family members, total strangers began harassing Cain on Facebook as a result of the sheriff’s office’s posts, causing the teen incredible amounts of stress that helped drive him to suicide. “It was like he couldn’t escape it for five minutes cause everyone around him shared it and was bringing it up,” said Alise Smith, Cain’s sister, to KREM 2 News in Idaho. Smith doesn’t believe the police to be single-handedly responsible for her brother’s death, but she has called the post “childish” and is demanding an apology from the persons responsible.